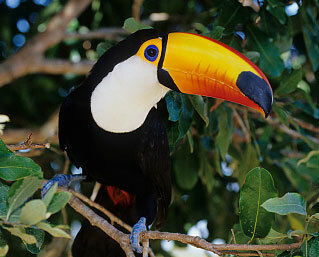 Today I want to write about a really cool and beautiful bird, the toco toucan. These beautiful birds grow up to 65 cm long, making them the largest species of toucans in the world. They are best known for their huge orange bills, which grow up to 23 cm long. Their bills have the largest surface area of any bird for their size. Even though they look very heavy, but they have air pockets and are very light. They use their bills to eat fruit and small animals, including insects, frogs, small reptiles, small birds and chicks. At breeding time, they lay 2-4 eggs in a tree cavity. Both the mum and dad help to look after the eggs and chicks. Toco toucans are quite common and can be found in open woodland and savannah throughout the South American countries of Bolivia, Peru, Brazil, Paraguay and Argentina. Are there any other interesting facts that you would like to share about toco toucans?